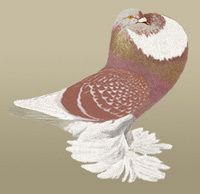 This is a less popular color and very rare.The color goes from a blue to silvershining creamcolor with red-violet in the neck.The eyes are tricolored with grey eyeborders. The checked markings can be dark, medium or light. Because they are very rare, you don't find much breeders anymore at the moment. Their level is low or moderate.